Reviews and recommendations for your animal communication library. Occasional interviews with authors of new and noteworthy books about interspecies animal communication, animal behavior, and our relationships with animals, available on live teleconference or on podcast. Membership is free! 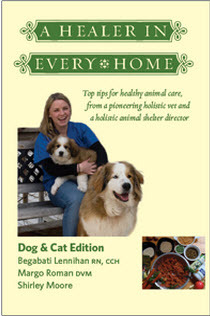 If you buy one book on animal health this season, let it be A Healer in Every Home: Dog and Cat Edition. You won't regret it. This little volume on the wonders of homeopathy and natural remedies will open doors and possibilities to help you not only preserve the health of your animals, but to treat them safely and effectively when veterinary help isn't immediately available. From their perspectives as a certified classical homeopath, holistic veterinarian, and shelter director, authors Begabati Lennihan, Dr. Margo Roman, and Shirley Moore have packed A Healer in Every Home with practical tips to help you manage dozens of common crises without resorting to drugs or despair. I was midway through the book when my recently adopted dog, the rascally cocker spaniel, Bobby, got into a bag of cat food and unbeknownst to me, apparently ate about half of it. Without going into too many graphic details, I'll just say that torrents of vomit and diarrhea ensued, and the over-the-counter treatments and probiotics I was administering seemed woefully inadequate to stem the tide. But then I happened upon the section of the book that discusses what the remedy Arsenicum can do, referencing its ability to quell diarrhea. As it happened, I'd gotten a basic homeopathy kit from Dr. Roman a few years ago, and fortunately for me and for Bobby, it contained a vial of Arsenicum pellets. I mixed four of them in some spring water and gave the solution to Bobby, in two doses. As if by magic, the diarrhea disappeared and Bobby's gastrointestinal tract returned to a quiet, normal state with no further incidents. It made me a believer. And chances are, you will be, too. Do you have a dog with itchy skin that nothing seems to soothe? The authors recommend the remedy Sulphur, at the 6c (low potency) dose. For kennel cough, Save A Dog founder Shirley Moore uses grapefruit seed extract, which also prevents and cures giardia. When her shelter dogs are whimpering from the loss of their former people, Shirley gives them a dose of the remedy Ignatia, with good results. For puppies and kittens who are taken away from their mothers too soon, Pulsatilla (30c) is the remedy to try. What makes this book so valuable is that it doesn't get overly bogged down in theory, but consistently presents actual case studies of real animals who were in physical or emotional pain, but who were then helped by homeopathics, supplements, and/or complementary therapies. My only complaint is that A Healer in Every Home: Dog and Cat Edition doesn't have an index. But that's just a small quibble. I'll say unequivocally that if you share your life with animals, it belongs on your bookshelf. A Healer in Every Home: Dog and Cat Edition co-author Shirley Moore will be one of the featured speakers at the upcoming Conference on Complementary Animal Healing in November. Her presentation, "Using Homeopathy to Heal Your Dog's Body and Spirit" will be on Sunday, November 11th. Your blog is very nice about the animal communication. There is no difference in the family world and pets. I am a professional animal communicator, using telepathy and compassion to connect with animals. To do so is my joy! I'd love to hear your feedback or comments, tips about new and noteworthy books, or authors you'd like to hear!